Spots & Dots Cleaning has been providing commercial cleaning services to small and large businesses for over 7 years. With our competitive pricing, flexible schedule and top quality, we are the premier choice for both large and small business owners. Whether you need a small office cleaned, or a large apartment complex, our professional cleaners are qualified on equipment that will work best for you. We are known for getting out those tough spots and dots that other office cleaning companies promised they would get out, but under delivered. We know that you will be satisfied with our professional office cleaning services, and you will be sorry you ever used anyone other company. If you're one of the many businesses thinking, "Can I afford a commercial carpet cleaning company to clean my office?" Call us, and find out! We offer competitive pricing options with multiple packages and are more than willing to get you the services you need with your budget without sacrificing quality cleaning. Our certified cleaning experts in PA or NY are waiting to talk to you about your commercial cleaning needs. We offer a wide variety of office cleaning solutions in the NY and PA area, from a regularly scheduled commercial carpet cleaning to medical facility cleaning or large apartment complex cleaning. Our commercial cleaning technicians are professionally trained, qualified and well known for always on time. We know that as a business owner, you can't wear all of the hats (even though you may want to), and sometimes, cleaning the office just isn't the top priority for the day. But it's one of the first things potential employee's notice; the first thing new clients will notice, and the first thing potential renters will notice; and you need to make a good first, and lasting impression. By using Spots & Dots Cleaning, we know we will exceed you and your staffs expectations whether you use us for commercial carpet cleaning, window washing, power washing or any of the other services we offer. Our team of commercial office cleaners will come to your office fully supplied and prepared for all of your cleaning needs. We are flexible with our scheduling times, and do not want to interrupt or disturb our working hours. So if you have special hour requests, or any specific needs, please let our cleaning experts know when speaking to them. 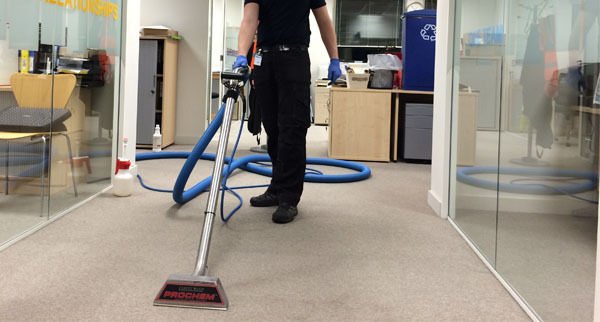 Our carpet cleaning team understands how important it is for your office to have clean carpets, but also how they need to dry quickly and not be a nuisance to workers, employee's or clients. We offer a variety of commercial carpet cleaning packages to fit all needs, including a product that dries faster than the competition. Call now to speak to find out more!